Boat Drawn from Customer's Photos, Sailfish from Chartworks Art "Mix & Match" page, layered together on a Chart of Key Largo. 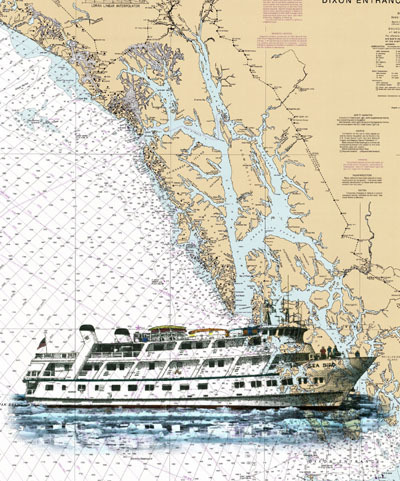 Cruise Ship the "Sea Bird" layered onto a Chart of Alaska's Inside Passage. We can also use your photos. Supply pictures of your boat (or house, or...) Choose a Chart from Chartworks Inventory. If the chart you would like is not in my Inventory, I can order it for you. I will design a custom Illustration from your photos and digitally layer it with the chart. The resulting Image can be printed in any size. $500.00 Art/Design + $0.30 per square inch for the Custom Print on double-weight matte paper or $. 45 per square inch on Waterproof Canvas. (any size). If we are ordering a Chart not in inventory for your project add $38.00 for the Chart and $120.00 for a Digital Scan of the Chart. YOU ALSO RECEIVE THE SIGNED DRAFT DRAWING AND CHART (if applicable). A 50% deposit is required to secure the project. The remaining 50% is due upon completion.